Partners in the IITA-Syngenta project have concluded a five-day training organized to improve and encourage the production of vegetables in West Africa. 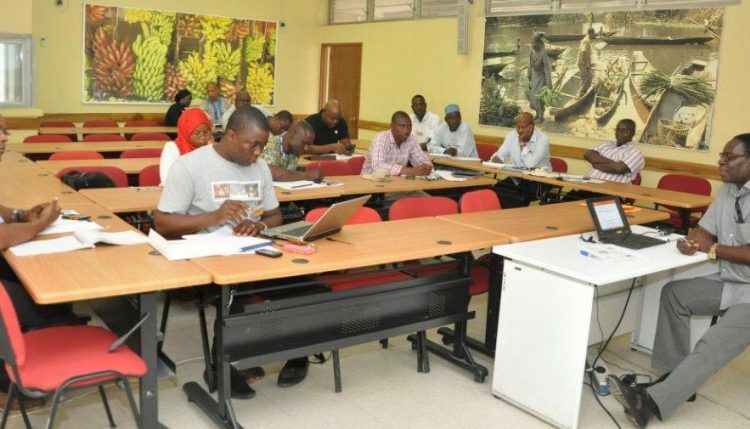 The training, held at IITA on 22-26 February, focused on different issues on vegetable production, including constraints to production in Nigeria, and best management practices. The training aimed for participants to have a better appreciation of the importance of vegetables for food security in Nigeria and West Africa; understand the key constraints to vegetable production and mitigation measures, and best practices in the establishment and management of vegetable field trials, and soil and water management in vegetable production; be better able to establish and manage vegetable nurseries and produce healthy seedlings for transplanting; and understand the major diseases and pests of vegetables in Nigeria and the appropriate mitigation measures. Baffour Asafo-Adjei, IITA’s senior agronomist and the training coordinator, during the opening program, stated that vegetable production formed an important component of the farming systems in most parts of Nigeria, especially in the savanna agroecologies where they are cultivated under irrigation. He indicated that apart from the employment and income opportunities that the vegetable value chain provides, there were numerous nutritional and health benefits from vegetable production, including provision of vitamins A,B, and C which help lower susceptibility to infections. Zoumana Bamba, Head, Capacity Development Office, said the training is intended to help improve production techniques, particularly in the area of horticulture, maize, cocoa, and other crops. He stated that the training would make participants more knowledgeable about vegetable farming to ensure high quality production. One of the participants, Emmanuel Okar, said the training was highly effective as it focused not only on the agronomy of the crops, but also on technical training, which will guarantee high yield, and on team building. Resource persons for the training included representatives from the National Horticultural Research Institute―Ajisafe Gbenga Adebayo, Akinwumi Henry Akintoye, and Emmanuel Ajayi; and Syngenta―Sunil Kumar, Klaus Gehmann Bernard, and Charlotte Andrea. The training consisted of lectures, group discussions, field trips, and practical field work for the 31 participants who were all staff of Syngenta and subsidiaries. Syngenta is a leading agriculture company committed to bringing plant potential to life through world-class science. Syngenta is in a 3-year partnership with IITA to transfer appropriate technologies to farmers producing maize and vegetables, accelerate food production in Nigeria, increase incomes, and alleviate poverty. The IITA-Syngenta research activities specifically aim to screen Syngenta’s maize, tomato, sweet pepper, and cabbage hybrids and identify those that combine higher yields with good adaptation to the Nigerian environment; and evaluate Syngenta’s best production technologies for the four crops alongside farmers’ production and intermediate technologies.